Craft storage ideas using a readily available, and often FREE, supply! Do you ever feel that you want to live simpler and use what’s already available? Hello fellow craft storage enthusiasts! Hazel here to share one of my favorite topics – re-purposing of old / unused / broken items. I’ve been gathering ideas on my Pinterest board, Pallet Power, as my husband and I are thinking about investing in a country retreat. We want everything to be self-sustainable and what better way to start out than using unwanted pallets, right? Not all my ideas are for craft storage, but 99% could be easily adapted for storing your stash, whatever your craft, hobby or interest might be. Craft Storage as Unique as You Are! Craft storage uniqueness by and/or for you! It’s Amanda here and this time I get to share with you some unique and fun ways you can store all your crafty goodies. Now when I think of unique storage, I think of DIYing your way to an inexpensive, functional and fun creative space that really expresses who you are. So here are eight awesome DIY projects that can help you make your space uniquely you! First up is this amazing craft storage table that was built by Shara (Palmettos & Pigtails) and her husband using Anna White plans. This beautiful table will not only hold a lot of tools and supplies, but it’ll make your space look awesome! Oh washi! So much washi! Well, here’s a fun tutorial (from Crafts Unleashed) for turning what looks to be a jewelry holder or a mug tree into a fun washi tape holder! Sometimes you can make the most amazing storage from things that you have lying around, things that you might even need to get rid of. Dinah of DIYInsired.com took the spring from her daughter’s crib and combined it with some baskets, pails and mason jars to make this fun and interesting storage item! Got some scrap wood lying around? Well maybe you can take a cue from Johnnie of Saved By Love Creations and put it together, paint it up, and add rods and clips, and it can store all sorts of fun things. I can especially see this as a display area for kid’s artwork, scrapbook pages or your handcrafted masterpieces! Steph’s thinking this would also make a great storage solution for your papercrafting embellishments, or even crafting tools! Maybe you have some old drawers lying around from that old dresser that fell apart? Well paint them up, put on some bright knobs and hang them on the wall! Yup just hang some old drawers on the wall for some unique and adorable storage shelves. A great idea via Everything Etsy! Decorating with pallets is all the rage. Why not take something that’s typically thrown away and turn it into something amazing? Saved By Love‘s Johnnie combined a pallet with a variety of thrift store shelves to make this interesting storage piece. It’s a work of art in itself! What about turning five file cabinets into one fabulously large work table with tons of storage? Click through to see the tutorial from Shara at Little Gray Table on how to put this beautiful piece together. Steph’s in love with this idea! Just about anything that holds anything can be used for craft storage. Take a look at how Rebecca of Older and Wisor updated a pie safe for her craft storage, and how she designed her craft room with only $75! Now that takes some creativity! These ideas are a reminder that your creativity doesn’t have to stop with the projects that you create in your craftroom. 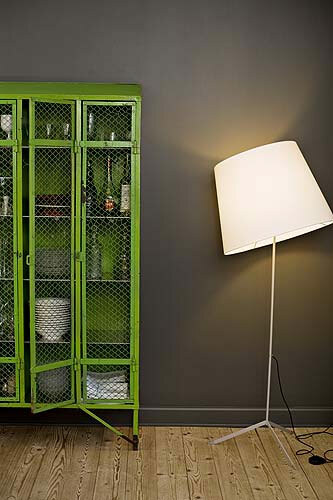 Harness your creativity to create storage and organization options that are perfectly suited to your needs. 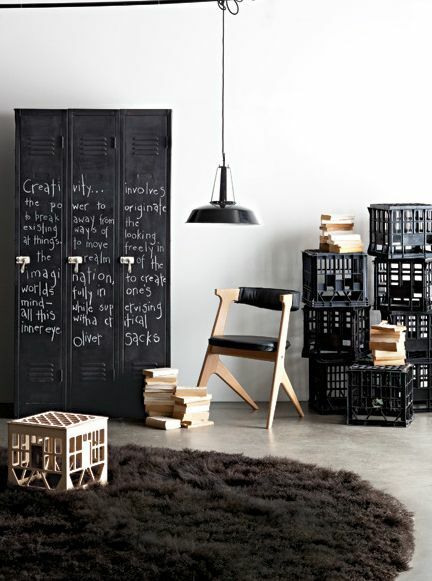 Are any of these ideas well suited to your craft storage needs? and creating, for craftroom storage! Author Amanda CorbetPosted on August 23, 2015 August 31, 2015 Categories All About the Furniture, Craft Storage Ideas, DIY Storage Idea, Re-Using, Repurposing, Unique Storage Ideas, VintageTags Amanda Corbet, cabinetry, craft room, craft room organization, craft storage, Craft Storage Ideas, craft tool storage, Craftaholics Anonymous, crafting supply organization, crafting supply storage, Crafts Unleashed, DIY storage, DIY Storage Idea, drawers, Everything Etsy, Little Gray Table, Older And Wisor, organization, organizing, Palmettos and Pigtails, Saved By Love Creations, storage, unique storage ideas, vintage3 Comments on Craft Storage as Unique as You Are! Creating clever craft storage using old metal finds! Hi everyone, it’s Kim from Stamping Imperfection to share some fun ways to upcycle metal storage containers to use as craft storage. I love giving new life to old items destined for the trash and I’ve noticed that this is a trait of all truly serious crafters! We have a tendency to buy new crafting supplies and then figure out a craft storage solution for them before we even craft with them! Why is it so satisfying to be able to take something from a thrift store or a garage sale and completely revamp it into something that not only has a useful purpose, but looks great? Honestly, that is a crafting/DIY project unto itself! Metal items can be a great addition to your craft room storage solutions. You find them available everywhere and there are so many ways to change them up for just a few dollars. They generally don’t require a ton of sanding and prep like a wooden item might. Here is a tool box idea created by Virginia Fynes of fynesdesigns.com. Tool boxes are great craft storage solutions. You’ll see these at garage sales and thrift stores all the time and they are fantastic portable storage solutions that are sturdy! I love that we can see that Virginia only paid about three dollars for this tool box! She transformed it for next to nothing with some metal spray paint and some gold vinyl dots – love this! Virginia is using this for her Project Life storage. Very clever! I love that this is so portable – you can take this from your craft space to your kitchen table to a crop at a friend’s house. Another easy way to transform a metal piece is to use Mod Podge like Sunush from Hometalk shows us with the metal cabinet below. This cabinet was covered with a double roll of wallpaper using Mod Podge. How fabulous does this look?! You can match any craft room decor with this idea for a few dollars in a few hours. Imagine how much storage this cabinet would provide for you in your craft space. This one looks like it takes a bit more artistic skill to create the incredible final result. Those of us who might be less artistically inclined might create a similar effect using stencils or vinyl cut with a die-cutting machine. This beauty was created by Brittany from Pretty Handy Girl. This is a thrift store find that was spray painted and given a faux zinc texture and adorned with chalkboard paint. Rustoleum has several faux metal spray paints that create amazing metal pieces to add to your craft room. This piece could provide great storage for your larger craft papers. Another great little find transformed on a budget is this little tool chest from Katie at Little House of Four. This is a great little craft storage unit for embellishments, threads, scraps, small punches…you name it! I love how simple this transformation is. We all have that one amazing sheet of 12 x 12″ patterned paper that we had to have, but never wanted to cut up. Why not use it for a project like this? You can see that Katie added some labels to complete her project and to make it a really functional piece. Simple, useful and budget friendly! For my final share, I want to show you how great these metal items are even if you don’t do a single thing to them. Here is an industrial looking craft room created by Larissa from Prodigal Pieces. 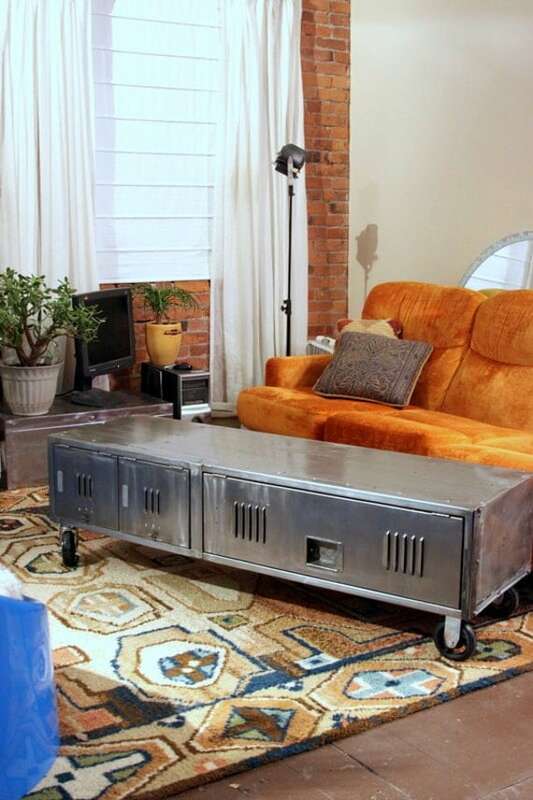 I love the vintage industrial look that Larissa has achieved in her sewing space. What does she store in those drawers? Look below to see how she cleverly uses hanging files to hold her fabric stash. Whether you choose to leave the metal storage items as they are or you choose to use your craft skills to transform them into something new and fabulous, don’t pass these items by at garage sales, thrift stores and clearance bins. you’ve transformed into useful craft storage! Thanks for stopping by today and please stop by my Stamping Imperfection blog and say hello and check out my latest stamping projects! 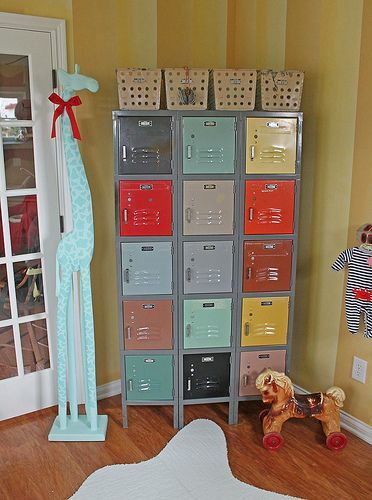 Craft storage inspiration is everywhere…even in schools! Once again it’s Hazel, all the way from sunny South Africa (SA) here with you today. About a year ago I did a post for Craft Storage Ideas on Ali Edwards’ studio. As both our “boys” are all grown up and “sorted,” we are seriously downsizing. Even though we don’t need that much living space, I’m still a HUGE crafter and my husband is a DIY fanatic. This means utilizing every possible space in a pretty and effective way. Another important thing to me is to recycle, reuse and re-purpose. 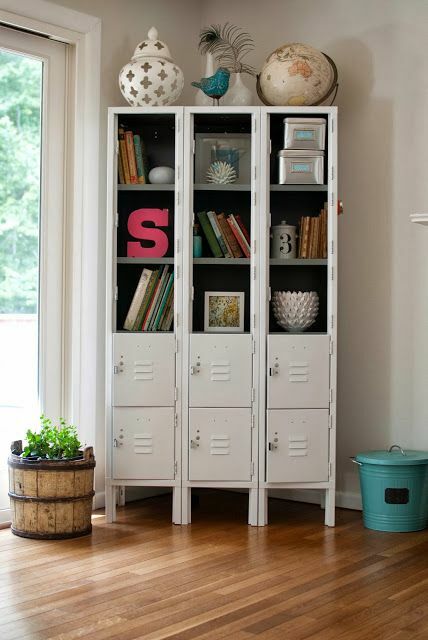 Today I’m sharing re-purposed storage lockers with you. Grab a cup of coffee (or tea) and hop along through Pinterest and Blogland with me. Oh, I just LOVE red!!! Be sure to check out ALL of the ideas they shared – Steph’s drooling over the library drawer cabinets! Just look at this colorful set of lockers! I love these stenciled numbers! You will see that I’m going to use this idea!! I hope you enjoyed our locker-love appointment. You are welcome to check my Instagram feed to see when my lockers are stuffed with all the fabric in my stash. Until we meet again, have fun, store your stash and if you have ideas to share, use #craftstorageideasblog on Instagram / leave a comment – we’d love to see what you do!! and don’t want to miss a single one? you’ll always be the first to see what we’re sharing! Hello fellow craft storage enthusiasts!! It’s Hazel all the way from Sunny SA here with you today to share the background to my Planner Storage solution. In the end I opted for a file to keep everything together and off my workspace. Remember, I shared it in last month’s Craft Storage Ideas Planner Blog Hop?? Today I’ll share the wonderful Planner Storage ideas that I found while working on my Planner File. First up is a beautiful wooden box. If I had desk space, this would have been the one for me. I found this pic on Belinda Selene’s website. My usual thing: Plastic and out of dust’s way. What about repurposing a beauty organizer from Target? Can you believe it? A Tool Caddie! What about a hanging jewellery organizer for your sticky note stash? And last but not least a video showing Belinda Selene’s stack of drawers to house her Planner stash. Oh. I love her stuff!! ENJOY!! That’s it. I’m off to Planner Planet. Thanks for joining me today on the Craft Storage Ideas Blog. Have a GREAT day! Hello, it’s Suzanne here today with some ideas for do-it-yourself craft/office desks. Did you know that you can make your own craft desk for a fraction of the price of purchasing a pre-made desk? And, there are so many options out there to choose from! I have some ideas for you that range from adding a top to a couple of cabinets, to DIY desks that require a little more assembly. For the desks that require measuring, cutting, and assembly, there are tutorials on the websites listed, so be sure to visit those sites for more information and instructions. IKEA products are so versatile, cost-effective, and easy to assemble. I just love coming across new ways to use their products. Shown below are the Alex drawers from IKEA and a wood table top. Could this desk get any easier? Castors were added to the bottoms of the drawers to make this desk mobile. With twelve large drawers for storage, this desk is a crafter’s dream. This is a similar concept to the desk above in that two cabinets of drawers were used as the base, but a glass table top was used as the desk top here. You could use any type of cabinets, as long as they are the same height and provide a comfortable sitting height. Another simple wood desk top, but this time, we have two standard filing cabinets below. Easy to put together and plenty of storage space in the filing cabinets. Here is more of a traditional type of crafter’s desk. IKEA components were used to create the desk unit, which leaves ample room for storage. This interesting desk uses pipes as a base. You would need to be handy (or know someone that is) to create this desk, but it is a cost effective way to get a nice solid work station into your craft room. Another simple desk idea using two bar stools and a wood-plank tabletop. This pretty desk offers a ton of space! I would love to work on a desk of this size and spread my scrapbook layouts all over one side. I hope that you have found some interesting ideas for your next desk. It doesn’t always have to cost a lot to get a new crafty station. By re-purposing some older items, you can create the desk of your dreams as well! Hello, Hazel here to share some organization with you. It’s a brand new year and I hope you are keeping up with those New Year’s resolutions. And what a better way than a Personal Planner. To get you on Planner Planet, have a look at this video from Belinda Selene. My planner is not only used to keep HQ Hamman on track but I love to use the leftovers from my scrap table to “zuss” it up a bit and it seems that the pages are always too small so …………. I add some pretty cardstock. When I page through, it always puts a smile on my face! What do you do? Keep your Planner goodies separate from your scrap stash where you have it on hand 24/7 or do you just make it up as you go? I find that it works very well to have everything in a caddy / folder as I work all over the show (house / office / while traveling) and hate searching for stuff. Make yourself a cup of tea and let’s stroll through Blogland to see what others do. First up, a bit of inspiration from Nadia van der Mescht Remember her??? And a great idea from It’s my Life – use boxes to put together your Planner station! Nothing that beats a bit of recycling. What about a handbag organizer for stickers and tags? And even plastic containers looks neat while keeping your goods separate. Now that you know what’s out there on Planner Planet, you can drink your tea and think up a storm about what system would best suit your needs. Before I go …………………………….. me and my fellow contributors will be back on Planner Planet as we are doing a Bloghop in March to share our systems. As always, it’s going to be LOTS and LOTS and LOTS of fun. Thanks for visiting Planner Planet with me today. Have a great week and please leave me some comments – I would love to hear what works for you. Hello, it’s Suzanne here today with a Storage Solution Roudup for your bead supply. Not only do we have a lot of beads around our house for friendship bracelets and other types of jewelry making, but I occasionally use beads in my paper crafting projects! Although I do not have a large collection, I’ll bet that some of you do. While searching online for various bead storage solutions, I came across a myriad of neat ideas. First off, there are plenty of storage containers that you can purchase that are already made for bead storage. I won’t feature any of those, because they are the obvious go-to choice. However, I have a few more suggestions from purchased products to do-it-yourself items. Here is a gem jar tray that can be used for any small items. I really like all of the clear solutions that I found, as beads can be so colorful and shapely, and deserve to be seen. This storage solution separates the beads nicely and let’s you see through both the containers and larger box that holds it all together. These pretty little re-purposed spice jars on a rack hold everything neatly in place. You can place the rack on a wall, behind a door, or in a cabinet. The pop of color in this wall-mounted display is really eye-catching! It is so pretty to look at, I’m not sure if I would ever want to use the beads inside the containers! This magnetic storage solution utilizes small, plastic SOLO cups, like you receive with your take-out food. A small magnet is attached to the back of each container, and then stuck onto a magnetic board. If you don’t have the space for a large, wall-mounted magnetic board, how about under shelf storage? Simply attach a magnetic strip under your shelf or counter, and a magnet to the lid of each jar. Voila! Instant bead storage! Here is another re-purposed storage solution; baby food jars. Baby food jars can be used for so many items. I really like the uniformity here, with the same sized jars and same colored lids. Here is a real gem! This old trunk case was re-purposed into a creative station, complete with attached bead jars. Beads and other small items are stored in the jars, which are attached to the back by magnets. How, you say? Well, there is actually a cookie sheet glued to the back of the case, covered in old dictionary paper, and then each jar has a magnet glued to the back of it! There is a FULL tutorial on how Amy made this case over on her blog. Be sure to check out her great ideas. Thank you for joining us here at CSI today. I hope that you have found some inspiring ideas to use for your own storage solution.